В творчеството на най-големия български комедиограф Ст.Л Костов, пиесата Големанов заема първо място. The Bulgarian play, Golemanov, will be performed in Chicago by the Melpomena Theatre company on 5 May 2019. Not accidentally, right after the mythical Bai Ganyo, Golemanov is the most popular Bulgarian literary hero, who is not only laughing, but also outrageous. He is the embodiment of the obsessed candidate for a Ministerial chair. It is a cartoon of the unbridled ambitions for power, money and glory. It is the embodiment of all the vices typical of modern state men. In the play, author St. L. Kostov shows us a few days in the life of a good man who becomes cunning and manipulative when he understands that he is likely to be elected as a Minister. He loses his sense of good measure and reveals his stupidity, hypocrisy, mischief, and huge ego. In the play, the author achieves an interesting paradox, turning Golemanov from a pillar of the state machine into a rebel against it. When the hero starts feeling bitter and unappreciated from his own political party, he begins to criticize even parliament and democracy, shameful bargains, as well as the morality and honor of the ruling elite. 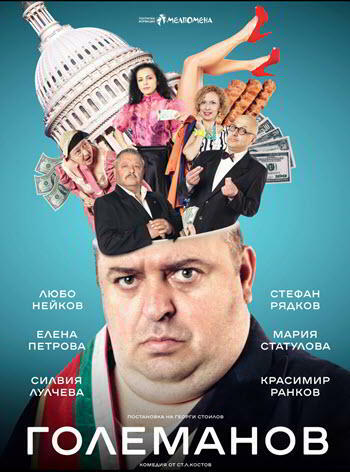 Above all, of course, in this remarkable comedy stands the figure of Golemanov himself. Through him St. Kostov mocks our political society, as masterfully as only very few Bulgarian writers have managed to do over the years. With its critical pathos and its bright, colorful images, with its tight composition and laconic dialogue, the play Golemanov remains one of the most precious conquests of Bulgarian satirical literature of all time.